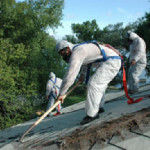 This Asbestos Roofer Supervisor course is designed for individuals who supervise the removal of asbestos roofing materials or persons responsible for inspecting a roof to determine whether or not asbestos containing roofing materials are present. It also includes topics required by OSHA for the competent person on a Class II roofing project where the material remains substantially intact. Below are the most recent student reviews for previous Asbestos Roofer Supervisor Courses. The class and instructor were extremely helpful and gave me all the knowledge needed to go to work. The class and instructor were extremely helpful and gave me all the knowledge needed to go to work. Very Knowledgeable and Convenient. Very Knowledgeable and Convenient.